If you’ve been reading this blog for any length of time at all, you know my husband and I love finding delicious, affordable and creative meal solutions. Sometimes we’ll take a recipe and tweak it, other times we make stuff up as we go along. We especially enjoy trying new products to see if they fit our tastes, our budget and our lifestyle. That’s what made the new Tyson Toppings coming out such a great thing! Here’s the story of a great summer meal that is fantastic for breakfast, lunch of dinner. Yes, a Jamie recipe is coming! A few years ago we discovered how good spinach and eggs together can be so whenever summer comes around and fresh spinach is in abundance, I always get a hankering for the combo. I was excited to learn there was a chance to try new toppings from Tyson that were not breakfast meats (OK, technically the bacon could be considered that, but it can be used in so many other things). I’m not much on breakfast meats and considering I was making a dinner or lunch meal solution, having something with a little kick in the flavor seemed like a fantastic idea. 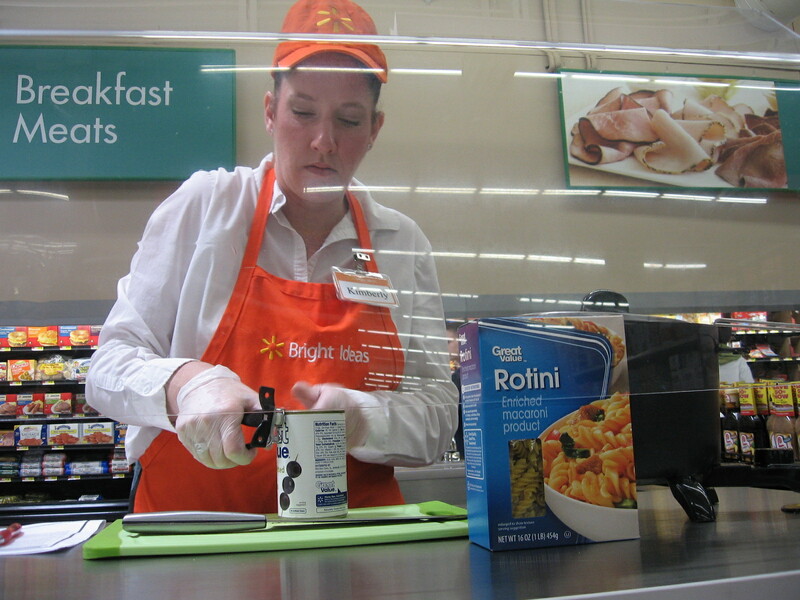 This is Kimberly, who is preparing the components to make pasta salad with the Tyson Toppings pepperoni. She chose sliced pepperoni, which she then chopped. I still wasn’t sure what to make to go with my omelettes so she gave me the good idea to chop and fry up some potatoes to make country-style hash browns. Great idea! Another meal solution we are going to try this weekend is putting pepperoni on zucchini with cheese and garlic and baking it. 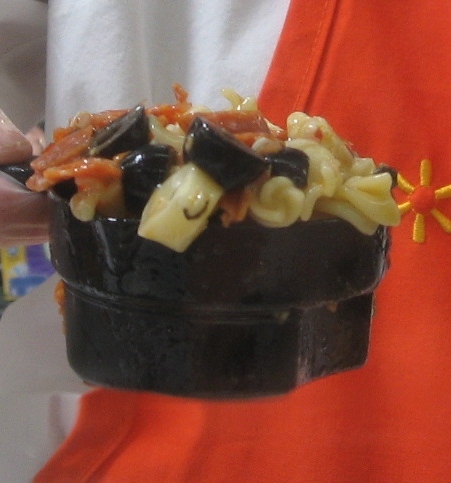 I have to show you a quick shot of the pasta salad that Kimberly made before moving on to my own meal solution from Tyson. Doesn’t that look good? Kimberly chopped the Tyson Toppings sliced pepperoni and mixed it in with fresh-cooked pasta from Walmart, olives and a new Italian dressing from Kraft. If this post is already making you want to try Tyson Toppings (bacon, salami, diced pepperoni and sliced pepperoni), I can tell you they are very easy to find in the meat section at Walmart. They are well-labeled and with the other meats like bologna, pepperoni and deli meat. It can be used in several kinds of recipes including my omelettes, French bread pizza, pasta salads (including mac n cheese for the kids! ), and as a protein-rich topping on baked potatoes or other vegetables. It is lower sodium than the other pepperoni options, which is important to many families including ours, who are trying to reduce the sodium in our diet. It has noticeably less greasy than the other pepperoni options. I looked at the package and on all the competitors, you could see the grease in the package. That was not the case with the Tyson diced pepperoni. It always helps me to know what I’m looking for and what it looks like. 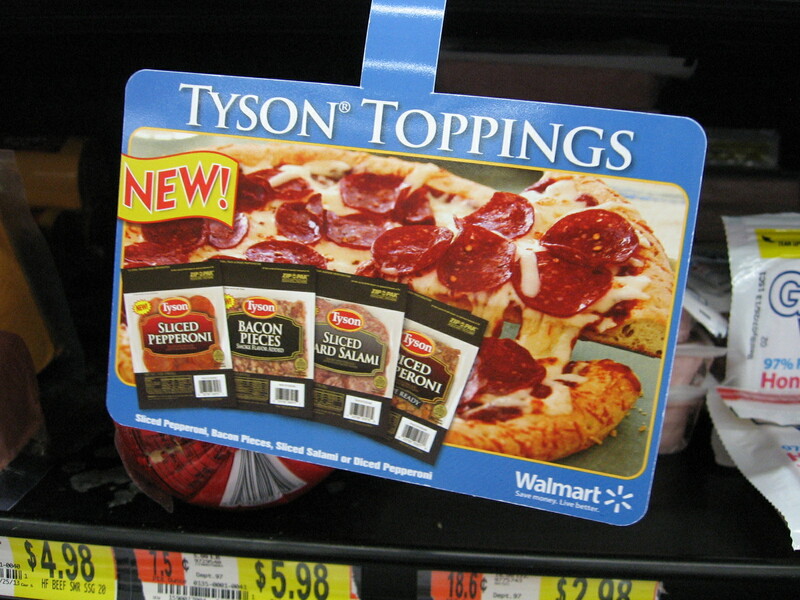 These directional signs with all four varieties of Tyson Toppings made that easy at Walmart. Home to make that yummy meal! 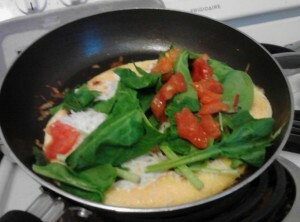 My omelette right before I folded it. The pepperoni is in the eggs and on top I put cheese, spinach and tomato. Turn the eggs (should look like a pancake at this point), careful to not break apart the formed omelette. If you do break it, it’s not the end of the world. The cheese will hold it all together! Sprinkle a layer of the cheese blend over the entire egg “pancake” then tear some of the spinach and if you prefer, some of the tomato. Try to keep it on one side of the omelette. Carefully fold over the egg so that the cheese, spinach and tomato are covered. Some spinach and tomato will fall out. That’s fine, just use it as a pretty garnish when you serve the omelette. Serve with fruit, potatoes or just by itself! Some might like marinara sauce or ranch dressing to go with it. Would you like to learn more meal solutions from Tyson? Follow Tyson on Facebook and Twitter. What ideas do you have for using these toppings? Share in the comments! Now that just looks delicious! I know my husband would love adding pepperoni to our breakfast meals! Stephanie, thank you! Apparently pepperoni and spinach is a common thing to make fritattas with. I did not know that until I started this shop! I just thought it sounded good. Thanks for coming by! I wanted to stop by and tell you you did an awesome job on this shop!!!! I can’t believe it was your first! NAILED IT!!! Wow, that means a lot! thank you, Courtney! This was my first food-related shop and I was really nervous. Your encouragement really helps! 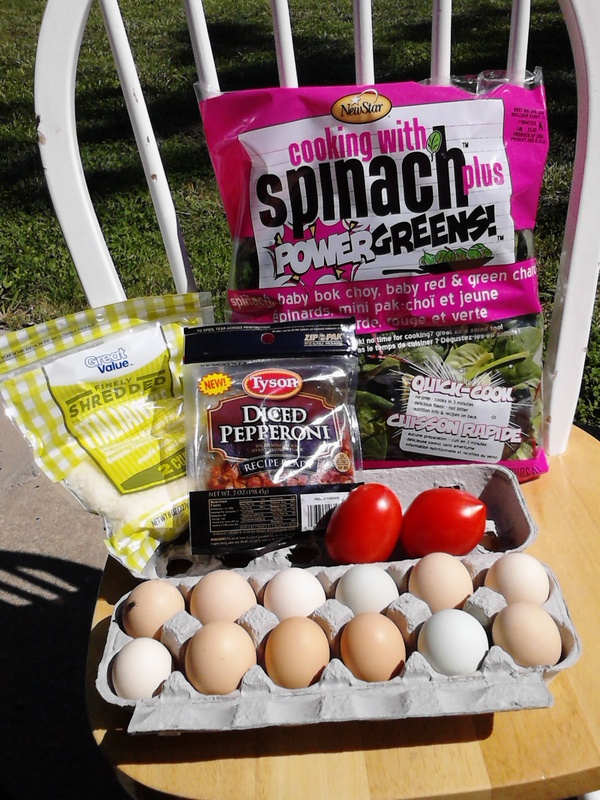 I buy the power greens too, love them but never ever even thought of pepperoni in my omelettes! It looks delicious!! I had never bought them before but would definitely get them again. We still have some and if they are still fresh, I’m going to make a salad this weekend with fruit and meat (heck, probably pepperoni!). By the way, what seems to be a popular recipe online for spinach and pepperoni and egg is to make it into a fritatta. A good idea for when it’s cool enough to bake! Thanks for stopping by. YUM! That sounds delicious! And I just want to echo what Courtney said – what an amazing job you did on this shop! Thanks, Cyn! Nice to see you! This technically wasn’t my first shop but it was definitely my first foodie shop. My food pictures have never been good but I’ve tried to take everyone’s advice and it’s helped! Yum! This looks delicious! I visited your G+ shop page yesterday, it was so fab! Love it! Thank you so much for stopping by both times! I need to check out your latest blog I would like to talk more on my blog about Internet safety. I love those in-store demos! I had no idea Tyson had such a big selection! My boys would love the pepperoni, but I’m thinking the bacon would be awesome on my loaded baked potatoes! I had the pepperoni on a baked potato with cheese and ranch dressing and it was really good! I think the bacon would be good too. I don’t care for bacon as a breakfast meat at all but I envision trying the bacon pieces maybe in a stuffed burger? That looks great Jamie. Great pictures! I’ll have to try that. I eat scrambled eggs and sauteed spinach nearly every morning for breakfast. Now, because of your recipe, I’m going to add some diced pepperoni! Great recipe and great job on your first food shop! Thank you! I would love to find out what you think of the pepperoni in it. I really do recommend the Tyson Toppings diced pepperoni because they are much less greasy than most of the round sliced versions. I had never had spinach and eggs before until, get this, that’s how IHOP made their green eggs during the Dr. Suess promotion a few years ago. Jamie, this looks and sounds delicious! You did such a fantastic job on this shop! Your photos are awesome. Love the Cap’n Crunch Peanut Butter Rice Krispies treat idea. Mmmm…. Thank you so much, Mel! On the Cap N Crunch, I would recommend making it into balls instead of trying to cut into squares. They don’t form as good as rice krispie treats and I think the balls would be easier for kids to eat. Thanks for coming by! These look SO YUMMY!!! Pinning in my recipes! Thanks! 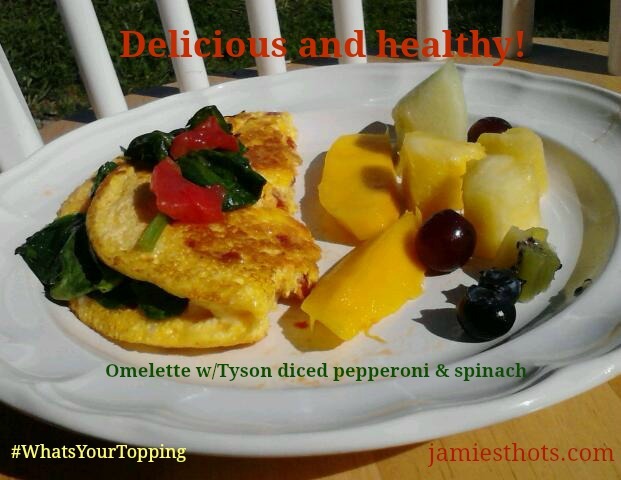 Jamie – I loved your post! This sounds like an amazing meal creation!! !